I know that we share a very similar outlook on food (right down to our mutual hatred of wet, gravy-logged food) and that we both love baking treats using wholesome and feel-good ingredients. 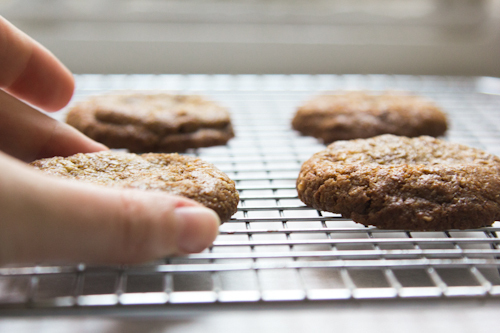 Both of us are big fans of using coconut oil and coconut sugar in baking and I think these cookies show just how wonderful these ingredients can be. I’ve yet to meet anyone who is able to resist the lure of a freshly baked cookie, still warm from the oven and full of melting chunks of chocolate. 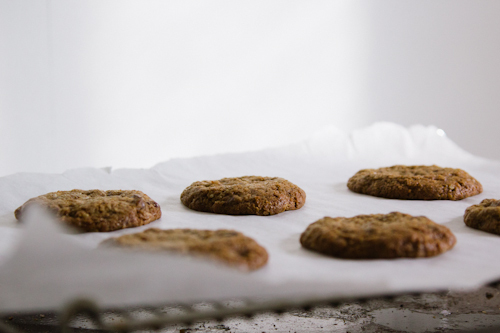 Their universal popularity probably accounts for the thousands of recipes that are out there and the time that many people devote to finding the ‘perfect’ cookie. This recipe is, I have to say, as close to perfect as any I’ve ever found and I’m only a little bit ashamed to admit that my boyfriend and I got through 12 of these cookies in 24 hours (in a vague attempt to install some kind of restraint in our cookie-eating habits, the rest of the batch is currently chilling in the freezer waiting to be baked when a cookie emergency presents itself – instructions for freezing are included in the recipe). The desiccated coconut – the third coconut hit in these – adds a heartiness and a bite and makes it easy to kid yourself that these are a perfectly acceptable breakfast food. I’ve used einkorn flour in these but if you can’t get hold of einkorn flour (I buy mine from Dove’s Farm) spelt flour also works well. Einkorn is an ancient form of wheat, rich in minerals and nutrients and easier to digest than regular wheat flour. 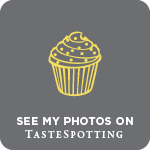 All of that is great but the main reason that I use it is that it tastes really good; not as aggressive as some other whole grains and with a sweet nuttiness that works really well with chocolate. So, congratulations to Mr & Mrs Little Loaf! I know that you two have a lifetime of homemade memories and happy days to look forward to together. First of all, preheat your oven to 170C. Spread the desiccated coconut out on a baking tray and bake for about 5 minutes until it just starts to turn golden brown. Remove from the oven and set aside to cool. 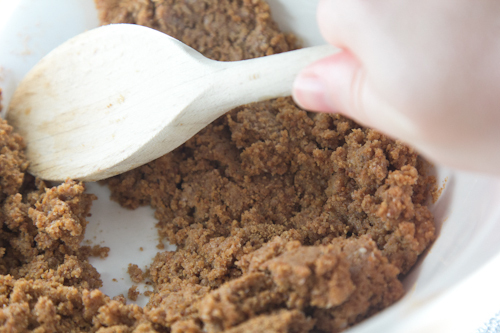 To make the cookies, beat together the coconut oil and coconut sugar with a wooden spoon until combined. Add the egg and vanilla and continue to beat until mixed. Fold in the flour, bicarbonate of soda, salt and cooled coconut. Finally, fold in the chopped chocolate. Place the mixture in the fridge for 30 minutes or so. Preheat the oven to 180C. Roll out tablespoons of dough and place on a baking tray lined with non-stick parchment paper. Bake for about 12 minutes until the edges of the cookies are just brown. Allow to cool on the baking tray for 10 minutes before transferring to a wire rack. To freeze, roll the cookie dough into balls and place on a baking tray. Freeze until solid and then place the balls in a sealable plastic bag. Bake from frozen and add a couple of minutes to the cooking time. I’m totally honoured to be standing in for you while you are off on your travels. I hope you have a wonderful time in Bali and you’re welcome in my kitchen any time when you get back! Two of my favourite bloggers together. How can it not be anything but wonderful. 🙂 These cookies look amazing. I have some coconut oil and coconut sugar in the pantry, so I’ll have to make these. Have you tried making these with coconut flour? I haven’t (yet) as I’ve not really played around with coconut flour much and wasn’t sure that I’d be able to get the texture I was looking for with it. I do have some sitting in my cupboards though so I might give it a shot! These are my kind of cookie too, and so happy to see Kate enjoying her honeymoon and her friends filling in for her! These cookies look incredible! The triple hit of coconut sounds amazing. Congratulations on your wedding Kate, I hope you have an unforgettable honeymoon. Um, YES to these cookies. x 10,000. Congrats on your wedding, Kate! Hope you’re having a fantastic honeymoon. Congratulations on the wedding! These cookies look wonderful! Any help with US conversions for measurements? What beautiful ingredients – coconut sugar is a pretty new to me ingredient but it was pretty much everywher in Bali (how fitting that that is where Kate is currently on honeymoon!) and I loved the taste! Admittedly I find coconut oil a tricky ingredient as its strong taste does not seem to work in everything but I am sure it works wonders in these cookies in underlining the coconut taste, and for a long-standing Bounty-lover, you cannot really go wrong with coconut and chocolate! these sound great! I love chocolate-dipped macaroons too, so I’m sure I’ll love these. thanks for the recipe! What a delicious looking recipe, thanks Kathryn! Hope you’re having a fantastical honeymoon Kate! Delicious ingredients!! I love coconut and chocolate so much and this look mouth-watering!! Absolutely gorgeous cookies, Kathryn! I would devour dozens. Enjoy Bali, Kate! What fun! Best to you, Kate, and congratulations again! Kathryn, these cookies look incredibly satisfying. I’ve been playing a lot with coconut sugar, and I love the multiple forms of coconut in this recipe. First and foremost, congratulations to the LittleLoafs, I hope the day was great and that Bali is fabulous (and foodie). Secondly, Kathryn, I love Dove’s Barn flours too. I used their malthouse flour for these bagels, which were oh so yummy. It must be fate that I forgot to buy biscuits for the tin when at the shops today; I can’t wait to try out these instead, they sound delicious. I think that should be fine – both have a lovely caramel sweetness and the texture would be the same. I’ve not made these cookies yet but looking forward to trying them very soon! These sound great! By desicated coconut do you mean you used coconut flakes or shreds? Does it make a difference? If I only have flakes can I whiz them in the food processor to throw into the recipe? I love coconut sugar and have just started using it. Thanks! Dessicated coconut is those tiny little shreds, unsweetened is best. I’m sure you could blitz up some big flakes though! They are delish! Used spelt and blitzed the coconut flakes to shred.